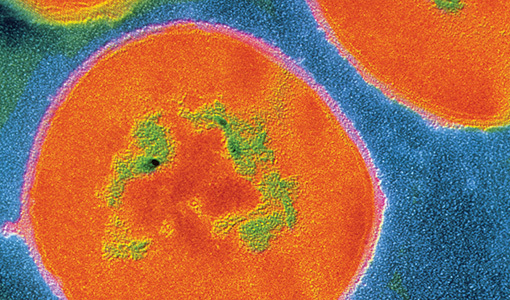 A colony of the Streptococcus viridans group of bacteria, the most common bacterial inhabitants of thehttp://sites.tufts.edu/dental/fall-2013/mouthful-of-microbes/ mouth and throat. We are not alone. Thousands of species of bacteria—millions of individual critters in all—have colonized almost every space on (and in) the human body. It’s a notion that may send you running for the shower, but without these tiny microbes, we’d be in big trouble. Many of these organisms evolved along with humans over hundreds of thousands of years, settling into a symbiotic relationship with our bodies. In other words: They need us to survive, and we need them. Remove certain bacterial species from your gut, and you’ll have trouble digesting food. Remove ones that live in your skin, and you’ll lose a valuable weapon for fighting fungal infections. The inside of our mouths is no different, says Brian Klein, a doctoral candidate in molecular microbiology at the Sackler School of Graduate Biomedical Sciences at Tufts. Klein studies this complex ecosystem, known as the oral microbiome, and says this motley crew of microbes could play an important role in protecting us from oral disease. It’s a new way to look at oral disease—not as an isolated infection, but as a system of moving parts. At the moment, Klein says, the challenge is figuring out what each individual species of bacteria actually does in the microbiome—how it interacts with its neighbors and what role it plays in keeping that ecosystem in balance. For the past few decades, biologists have focused on understanding a microbe’s DNA to determine how it fits into the microbiome. Identify what each gene in a bacterium does, and it’s possible to tease out how it lets that bacterium survive and interact with other species. For some microbes, Klein says, that’s not so hard to do. Researchers simply replace a single gene with a dud—one that doesn’t work—and wait to see what happens. The process is a bit like taking a finely tuned sports car apart and rebuilding it with a one piece missing. Maybe its absence causes the right wheel to stop spinning, or the transmission to rev out of control, but you’ll quickly see what the part does for the car as a whole. This method, called “site-directed mutagenesis,” is a common tool for studying certain bacteria in the lab, and has been used to piece together the role played by the thousands of species that live in the human skin and gut. Microbes in the mouth, however, can be a little more slippery. Klein says that some of the bacteria that reside deep in our gums resist this sort of genetic manipulation with an enzyme called a nuclease, which chops up any incoming bits of DNA. As a result, they’re incredibly difficult to study using existing methods. In this way, the researchers can create an extensive “library” of mutated genes that they can browse to learn what each one does. Klein says this technique, which he and his labmates are refining, could lead to new treatments for oral disease. Many existing drugs, such as antibiotics, take a shotgun approach to treating infection, killing off large numbers of bacteria indiscriminately. As researchers such as Klein learn more about the genes that exist within oral microbes, however, it may be possible to take a more focused approach, targeting only the specific types of bacteria that are causing the infection. While treatments like this may seem promising in theory, it could be years before patients benefit. At the moment, Klein says, scientists still don’t know enough about the complex ways that bacteria interact in the mouth—but as he and other researchers slowly piece together the inner workings of the oral microbiome, they may one day help revolutionize the way dentists treat oral disease.